Welcome Back ! We are back with a bang with a super cool offer. An offer that would make you pounce on every opportunity to get it. So here’s an unlimited recharge offer. Buyhatke a shopping research portal that helps you make superb buying decisions while buying online is offering it. Its a very simple process and within 5 minutes you can get a mobile recharge of Rs 50. And you can get more recharges as well. First let’s get to know about the app and then I would explain where inside the app is the trick to get free recharge. So what is the buyhatke app all about ? Buyhatke app has been known to be among the must have apps on mobile by Times of India. 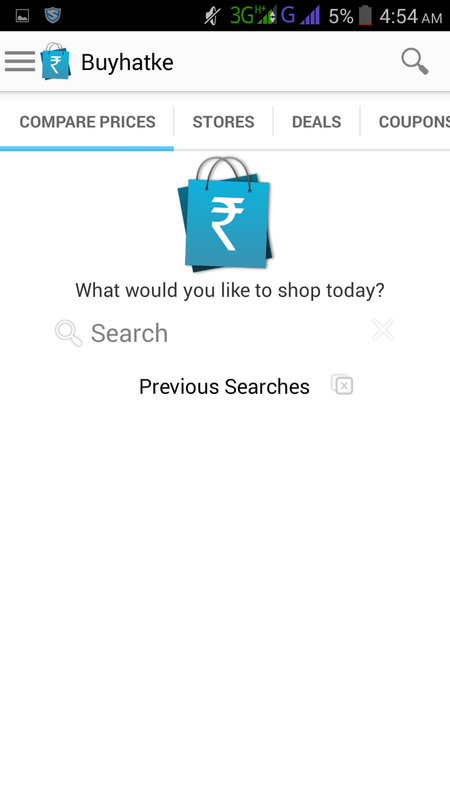 They say it is the best way to shop on mobile. Buyhatke gives you the ease of shopping across all major shopping portals with intelligence of price saving. The app gives you price comparison, coupons, deals, price drop alerts all at once place with a simple and intuitive shopping experience. Not only that it gives you a lot more. Now you would see this kind of symbol on the top. Click on it, now you would see the promotions tab as shown in picture two. You can see the terms and conditions, how it works, referral statistics and refer option there. From the refer option refer to your friends via different channels. Whatsapp, facebook, twitter, mail are the most effective channels. As your friends join you can see the referral stats by clicking on the referral stats option from the side bar. You would get a mail mentioning that. Really Your blog is very interesting, i am also suggest to my friends to read your post. I am very happy to visit this site.